Make sure your pets have their best camera faces ready! As part of RSPCA NSW’s annual holiday tradition, ‘Santa Paws’ will be stopping by to bring some Christmas cheer and to pose for photos with you and your animals. RSPCA NSW’s annual Christmas tradition is back with Santa Paws bringing some Christmas cheer! This holiday, he is ready to pose in his bright red suit for photos with you and your animals. If you want your pet to sit in his lap or even your whole family (with Santa Paws’ permission of course), then make sure to head over. Dogs, cats, guinea pigs, reptiles, rabbits, chickens and horses… they’re all welcome to meet Santa Paws! 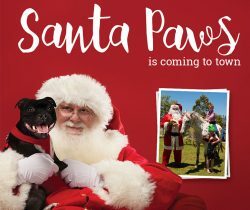 Santa Paws will be visiting RSPCA locations across the state. Don’t forget that with every photo you are giving support to animals in the community. All proceeds will assist the cost of providing food, water and a safe place to be loved for homeless and neglected animals across our shelters. So why not get you and your pets in for a photo and some festive spirit! Get yourself on the nice list! Please remember that you can bring any pet you like, just make sure he or she is contained. So cats, pocket pets and reptiles should all be in carriers and dogs should be on leads. You should book a photo session in advance to avoid disappointment! Photo packages and prices will vary, so call or visit your nearest participating location for all options. All locations are listed below. If you would like a festive photo with your pet, here’s when and where you can find Santa Paws. Illawarra Shelter Sunday 9 December, 9 a.m. to 4 p.m.